Class 10 microSD cards are something that should be on most of your lists of “must have” smartphone accessories. Well, assuming your phone can take them since many manufacturers have decided that the hot trend of the moment is to remove slots for them. But if your phone does have an SD slot for expandable storage, there is nothing like having a ultra-fast card for dropping media or ROMs on in seconds. 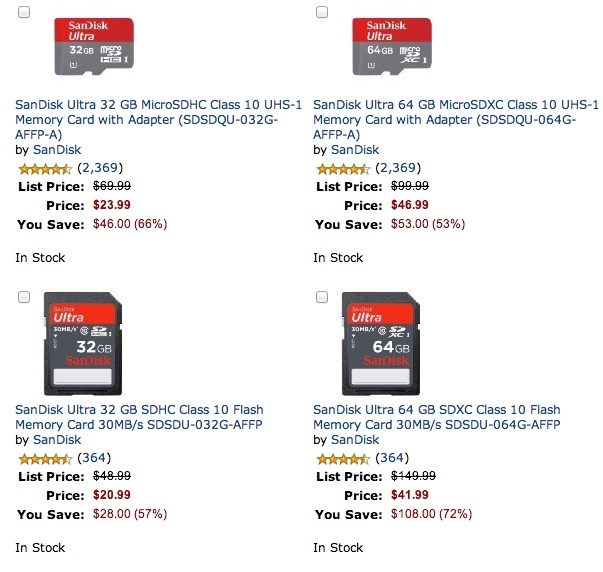 Amazon, today, has dropped SanDisk Class 10 32GB and 64GB microSD cards by 66% (23.99) and 53% ($46.99), respectively. If you already own one and need something else, like a regular SD card for your point and shoot camera, those have been dropped as well. In fact, the 64GB Class 10 regular SD card is 72% off. Not a bad deal. Remember, that not all phones can support 64GB cards. The Galaxy S3 and Galaxy Note 2 are a couple that do.